Once the insert to a classic tanker desk's utility drawer, we repurposed this neat Industrial piece for use as a desktop organizer. Steel has been newly powder-coated in metallic Bengal silver. Features three slots, ideal for storing coins, pens and pencils and other small office supplies. 3 available. This listing is for one unit. Dimensions: 13" W x 4.75" D x 2.25" H.
Desktop organizer in solid teak. Great quality with fine details. Made in Denmark in the 1950s. 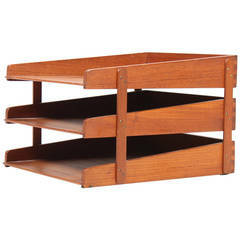 Very functional Danish modern teak desk organizer / letter tray. The piece is in excellent condition and measures 23.5" wide, 9." deep and 6.5" high. The "Bulletin Cube" cork desk organizer for pens, pencils, and note paper. Vintage black wall organizer Usten Silo I (large one) by Dorothee Becker for Design M made of black ABS plastic and nickel-plated metal.